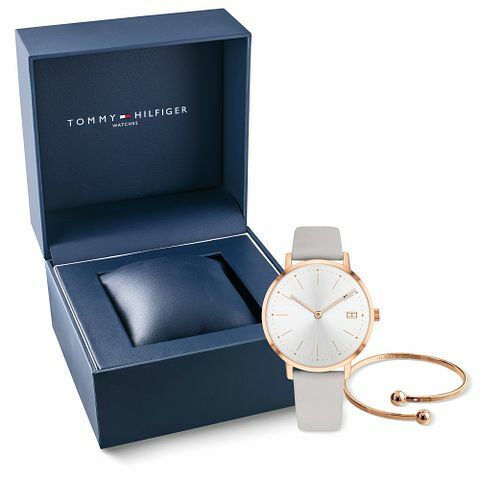 This classy ladies' Tommy Hilfiger gift set features a gorgeous gold plated Tommy bangle and co-ordinating watch with 35mm gold plated case, smooth white dial and chic grey leather strap. Presented in a Hilfiger giftbox, this set is perfect for a present. Tommy Hilfiger Ladies' Watch & Bangle Gift Set is rated 5.0 out of 5 by 1. Rated 5 out of 5 by Anonymous from Amazing Absolutely amazing my girlfriend loved it although the bangle is quite small for some one with a skinnier wrist .